I love this question, posed by a reader, both because I love writing about the financial realities of homesteading, and also because the question of how we afford to homestead, and how homesteaders support themselves is an under-discussed topic in the world of “self-sufficiency.” Plus, when I meet new people that are not in homesteading circles, it’s the question that they either flat-out ask, or you can tell that they desperately want to ask, but have been raised not to! 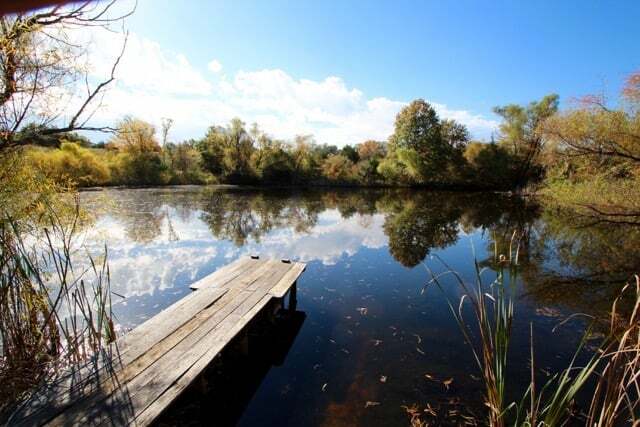 Our decision to move to Missouri was a complex one, but a large factor was the affordability of the land, and the opportunity to create an off-grid homestead. We purchased land in rural NE Missouri for under $1,700 an acre, and our property taxes are under $200 per year. As I talked about in this post, we could have never afforded to buy land in the area of Oregon we loved. In moving, we gave up amazing community, work in my field, and culture in favor of purchasing land without going into debt, and co-creating a land-based community. We arrived on our land with cash designated towards building a house and installing a solar electric system. We planned for those expenses, and stuck to our anticipated building budget. 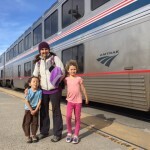 What we didn’t plan for is how challenging it would be to move to a new state, find new jobs, and build a house, start a homestead, and homeschool two children without enough additional savings to cushion us through the transition. Brian was working full-time building our home. I was working full-time caring for our children so he could build our home, and also trying to float our family financially with my blog and part-time employment in a school garden. Needless to say, our financial situation was very, very tight. Once our house was built, Brian was able to re-focus his energy on building his artist blacksmith business, and we launched our Etsy shop, Acorn Hill Handcrafts. That first year was a tough one. I had naively assumed that “if we built it, they would come” but the customers never came. Thankfully, the holiday shopping season boosted sales, we refined our product line, and we’ve seen slow and steady increases since. Combined, I estimate that Brian and I together work a 30 hour week. And our earnings reflect this part-time work week. However, this is where I need to pause and talk about WHY we’re able to make our lifestyle work: We have time to make, do, and create what we need. The time we both might spend working full-time is instead poured into creating a homestead that provides us with food, shelter, energy, water, and a whole lot of recreation. We work for ourselves (perhaps the toughest bosses of all) 7 days a week, but we work at home, on our beautiful piece of land. We have expenses, real expenses such as property taxes, car maintenance, health care, and food, but by keeping our overall expenses low, we can afford to work fewer hours at our paid jobs. There are so many other ways that we save money, but you get the idea! Even today, as we baked 4 loaves of sourdough bread in our brick/cob oven, we estimated that we saved $20. I have heard from business owners that it takes three years for your business to show a profit. We relocated to NEMO three and a half years ago (but spent a year house-building). We rely on some savings to handle homestead emergencies (cow vet bills, unexpected car repairs, alternative medicine, dentist bills, etc. ), but I feel like we are on track to create a diversified homestead income stream that will support our every day expenses and occasional big dreams. 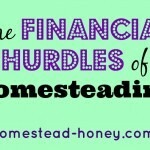 What other questions do you have about the finances of homesteading? 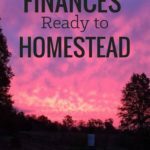 How do you afford to homestead? I love your honesty! My fiancé and I both work in education and my dream is to create a homestead that we can retire on. We wouldn’t have to rely solely on the homestead to generate income, but I think it would be a nice supplement. Once the initial set up is done, how much back-breaking labor is truly involved? I just want to grow vegetables and raise some chickens and alpacas (for fiber and fun). Well, I guess my answer would depend on what you call back-breaking work. We work from sun up to sun down. Some of that time it’s working on the homestead, garden, or animals, some of the time it’s paid work, some of the time it’s child care or life maintenance. So it’s not all physical labor, but we rarely are sitting down, and never doing nothing. But we do take breaks, just like we would at a “real job” and our breaks just happen to look like pond jumps and walks in the woods, or petting cows. So it all balances out very nicely. There is a lot of physical labor, even just putting in a garden, and cleaning out a chicken coop. But taking breaks and going slowly really help keep it fun. Sarah – I had to respond to you because that is EXACTLY what we want to do! Grow veggies/fruits, chickens, and alpacas! It’s funny to come across someone who wants alpacas too, since they seem so random. But they are lovely! I am starting to do my research on all of it now, and I LOVE that I came across this blog! I definitely subscribed and will be coming back to read it all. Teri, what you guys do is amazing! Keep it up! Thank you for your blog. I love to read about the journey you have taken to create a homestead. I wished I would have done this same journey while raising my children . I am on the other side now getting ready to retire from nursing at 61. My husband will work until 66 then teach in his retirement. We are empty nesters ..all children grown and on their own. We plan to downsize our home in the next couple of years to get ready for retirement. We would like to buy about an acre of labd and build a small home with a small amount if money. We live in Washington state , which has high cost of property. With 3 of our children and 1 grandson who is 2 that live here, we do not want to move to another state. So, we are having to really search for a piece of land to build on with a small savings. Your story helps to teach me what you and your husband have done to create a wonderful life homesteading. I look forward to reading more . Thanks so much for commenting! It’s great to hear of people setting their sights on a small home on land. I agree that Washington can be a pricey place. I hope you find the perfect piece of land! I hate to give my secrets away. ..but…we ended up in sw Washington where it’s a bit more conservative and property value was low. It helps that we bought a repossessed house. I’ve also seen really low prices in north eastern Washington but always keep water in mind thereand realize you’ll need twice as much land as fertile western Washington. Thanks for sharing your experiences, Mary! secrets and all!! Amazing and inspiring! Thank you for this article. The take-away for me is to just get started with what you can but keep going – be consistent with your moves to become more self-sufficient. I CANNOT wait to get started. A year and a half from now, I hope to have even half of the success that you and your family have reached. Just one step at a time, Christine! That’s absolutely it. We’ve been doing this homesteading thing for over 16 years! It looks a bit different every year, and certainly things changed quite a bit when we had children, and then again when we moved to MO. You’re doing great!! So much of lifestyle is making how you choose to spend your time match up with how you spend your money. When I dropped out of the steady paycheck world, I knew I had to make what I had go farther. I chose fun and personal interest over the mind numbing slog of a regular job. I came to appreciate small opportunities, small gifts, friends and caring community that I didn’t have time to attend to when I was working all the time. All the money I could have made with my time would not replace all the experiences I had with that time instead. One thing I was blessed with is a strong work ethic that was evident to many people – that alone got me more work (and money) than I might otherwise have if I had just been having a good time. Skills are crucial when you are living a marginal lifestyle! Obviously it has taken you time and commitment… but I’m impressed. I’m glad it seems to be working for you- as a homeschoolers myself I know that can be a time commitment all by itself! Does your husband also go to the home shows to sell? I’ve seen a number of artisans at them before. No, he does not go to home shows. He really is not much of a public salesperson. I would do a much better job selling his stuff!! And that might be something we do down the road, but it’s hard to leave our animals to attend shows. How do you plan for retirement? I love the idea of homesteading and living off the grid, but I also know as I age, I won’t be able to continue doing a lot of the work that’s involved. Yes, this is true, Pammy. We don’t have retirement accounts. And after watching loved ones lose a great deal of their retirement savings in the economic crash a few years ago, I don’t feel all that comfortable putting tons of money into retirement plans. Our biggest investment right now is our land, and our skills But yes, I totally agree with you that as we age, we will need to reduce the manual labor that we do. I would like to have more savings on hand and a reasonable plan for the future, but right now, we’re building. My husband and I were just talking about making further changes to our lifestyle – mainly, reducing our income-earning hours to devote more time to our family life, home, and land. This is such an important point for successful homesteading. Yes, I can go to work and earn money to buy the things I need. But after 30 years of earning an income, I haven’t felt the same simple satisfaction that comes from making for myself what I need. For our family, we have taken small steps to move to a “homesteading lifestyle”. And we are continuing to adjust over time. Yes, so so true, Michelle! We truthfully could not do all that we do on our homestead without reducing the hours that we work. And the things we do on the homestead really do save us money. Even make us money, when you count egg and milk sales. We still have a bit to go before we reach a balance that I feel comfortable with – I think our income needs to expand – but it’s getting closer! Can I ask…are you able to save much? What about for retirement…if that is even a concept for you guys? Perhaps Ive been duped by the government and consumerism…but I wonder if we gave up our world as it is and went and lived full time on the land…what of the future? It’s true, in this season of our life, we are not saving much. Here is my philosophy: I refuse to put off enjoying life and living my dreams until after retirement. I have heard too many stories of people who “waited” for retirement to live their dream, and then something happened. I will never be rich, I will probably always be working, and I hope that my children will help me a bit in my older age. It is my goal to increase our income to the point where we are able to save, but as I mentioned in the blog post, we had to invest a lot of money in starting over here. so we’re in a rebuilding process right now. But in general, I think that if we all gave up our world and lived full time on the land, we’d all be a whole lot happier! Yes, I totally agree with you about living on the land 🙂 it would make the world slow down and that’s got to be good right! I guess it’s about perspective change…for now and retirement. Thankyou for sharing your thoughts 🙂 they will go towards helping me reframe mine!! This is just the passing on of something I once read, but it seems appropriate due to the questions being asked re. retirement. It was just a guide, but whatever your annual spending is, multiply that number by 10. If your annual expenses are $25,000 then you would need $250,000 in a retirement fund. This is important here since the cost of living is substantially reduced. If your annual expenses hover around $5000 then a retirement fund of $50,000 would be sufficient. It sounds simple (maybe that’s why I could remember it:) but it also makes since. One could always save “extra” to safeguard against the unforeseen, but as a general guideline, I like it. It’s something I keep in mind as I try to reduce our annual expenses. That’s a really simple way to think about it! I did read that this multiplier assumes your also collecting Social Security income. So, as self-employed folks, we’d need to make that multiplayer a bit larger. Still, it makes for a great, simple reference! Thank you for sharing it. You are doing the work now by building and creating what you need to live .That work should only be done once if its well done and whatever it is can be used through to your death. So retirement involves using the things you have already created so there should not be much difficult stuff left to do when you are old. Putting money aside is always a good idea if you can but money is not the driver. You will have kids around and grandkids probably , others to help with or do all of the work , planting is easy enough if you have a good garden . When you get so you can’t get around or can’t cut wood ,or get to town then you need to think about moving close to a hospital or old peoples home . Nothing shameful there we all do it in the end and if you are lucky your kids will let you stay with them. How wonderful it would be to live off the land. Alas, I’ve been on disability since 1995, & we live in town. However, when we bought this house in May 2014, we decided to do what we could to be more self sufficient. We started a garden that very first week… It was just 12 strawberry plants, 6 tomatoes, & 3 blackberries. The following month, we added some radishes & greens. I canned about 30 jars of goodies that summer. Last year, our strawberries had multiplied to 85 plants, & 10 blackberries. We doubled the garden size, and added green beans, potatoes, & more. I Canned 850 jars, & froze some fruit. We haven’t had to buy green beans, tomatoes, strawberries… This year, we dug out 25 blackberry plants. (They just take up too much room for the berries they give.). We now have over 125 strawberry plants. With bartering, we now have a tiller, so we doubled the garden, again, plus added 2 raised beds. They are 22″ high, which makes gardening much easier for me. (While they weren’t cheap, they are well built, & should last 7-10 years.). I hope to can over 1000 jars this year, including soups & organic meat. I’ve traded my jars of jam for fresh cherries, apples, & essential oils. Plus, I sold over 100 jars of jam last fall, making about a $320 profit. I also sell crocheted scarves, & shawls, etc. I grew my own seedlings this year, saving about $45-50. This spring, when we wanted to do some landscaping, we traded 12 strawberry lasts for 6 large hostas. Our little tenth of an acre, right in town, doesn’t sound like much, but it’s enough to keep me busy, save us money on groceries, & keep us in high quality organic foods. That sounds incredible, Laure! I’m always amazed at how much you can do on a small lot. One of my best gardens ever was on an urban lot that was transformed into a front yard garden. It was incredible how much food we produced! What a great blend of bartering and selling and keeping for yourself you have going! Thanks so much for this post, my husband and I are workinf on building a homestead while decreasing our “working hours”. One thing I think and worry a lot about is retirement or if for health reasons we are unable to continue fully in the physically lifestyle which self sufficiency requires. Like you, right now we are scraping by with a small child while we rebuild an old home and also build up our homestead and income sources. What are your plans for retirement/aging if you don’t mind me asking? We hope to keep increasing our income and add some passive investment and have started a barely worth speaking of savings account for our next investment. That’s kind of our plan too, Jen – to keep gradually increasing our income and to put some away each month. I hope to be close to that point by the end of the year, but building a business has been a slow process! I love this post. It really resonates with me. I am in the middle of trying to live a frugal life and work full time near the city, while enjoying that land that I’ll retire on someday. My plan is to retire debt-free on my little homestead. But I will still need some sort of income. And I’ll need to have a livable home and things like a septic system in – before I live there full time. Thank you for this post. 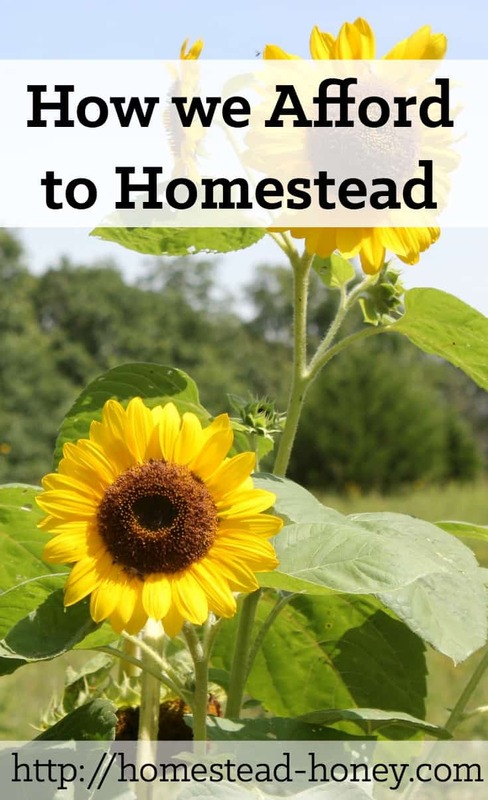 It’s so great that you have a little homestead to get started on!! What a fun adventure as you fix it up and prepare to live there! I think that being flexible with where you live to get more affordable land is key. Where we live in Australia we are priced out for land. I don’t handle the heat well and started looking into Tasmania (the little triangle bit at the bottom of Australia) as the climate is allot cooler. What I found is the land is so much cheaper there. We wont be able to move straight away but as more of our house in suberbia gets paid off hopefully we’ll be able to sell and use the proceeds to buy there. My husband is a teacher and although he will be wanting to stop working full time he’ll still work part time or casual. I have some friends that just moved to Tasmania – sounds like a lovely place to homestead!! You want to get there and buy it now because there are even people in far north Queensland talking about doing the same thing and its not that big a place . In fact we often leave it off the map altogether. The south and west are pretty horrific places to live with cold weather coming up from the antartic so that narrows the select land to the north east and north reducing the available choice land further. Down near port Arthur the land is poor so don’t go that way. The convicts had to use sewerage direct on the garden beds to get anywhere and it took years before they could use the garden beds for production. Hi, I found you on the Whole Food Kitchen Tour. I really like your writing and admire the choices you have made and the hard work you are doing to offer your children a truly happy life. I will stay tuned to see how things are going! Your kitchen looks so cozy and inviting. Thank you so much, Vicki! I’m glad you found your way here! Thank you for this post. 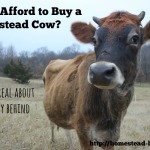 It’s really good to hear your honesty about the financial side of homesteading. We are really just starting out and my hubby still works full time to support us.I don’t know that we will ever be completely dependent on homesteading for our income, but it’s nice to think that I can contribute significantly to the family income through my endeavorsthrough . Having that full-time income is really nice. It puts a lot less pressure on the homestead supporting you. On the flip side, having income from the homestead is very reassuring, knowing that if anything ever happened to that full-time employment, you’d still have the homestead income. I’m all about diversifying! Hello. 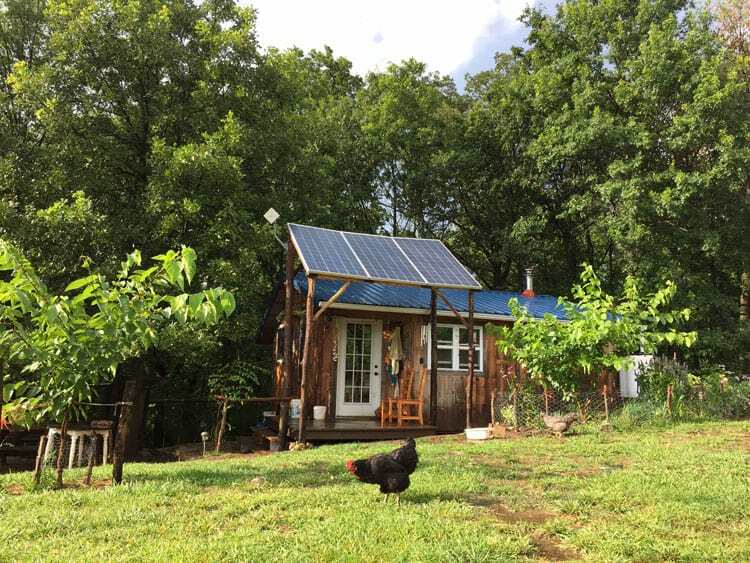 I just happened across your web page when searching for off-grid living in Missouri. My husband and I (as well as 3 of our kiddos) live in central Missouri aprox. 30 minutes from Columbia. 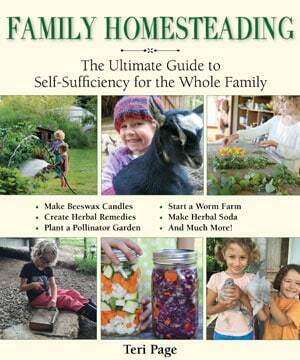 We have always been interested in homesteading and simpler living… but our lives have been anything but simple! Ha. We have home schooled our 4 kids and just have one left that is still schooling. one has moved to Oklahoma, and our oldest daughter will move out to attend law school this fall and one working , but still living at home. My husband has driven a semi for about 18 years now, so most of the parenting has been my responsibility. We have always wanted to have a way of life that would get him off the road, but his income allowed me to stay home with the kids and when he was home… so were we. And with home schooling, the kids were able to ride with him as well. As the kids are starting to fly from the nest, we have been thinking more and more about being able to get out of trucking and enjoy a way of living that we have always dreamed of . We have always had some kind of farm animal(s) over the years, gardening etc., but we would love to be able to spend our time as we choose to a much fuller extent. We also realize that …. it takes money! So we have debated how to go about creating a passive income while we live the life of our choosing. Many ideas… but for us it will probably come down to saving up more money for a while from his trucking business, as well as side income possibly from flipping properties. We have been in the real estate business for many years ranging from sales (I have a brokerage license) and rental properties( that we no longer own), and flipping. My ultimate goal would be to save up enough money to purchase enough rentals with cash and live off the income they produce. There is work involved in the rental business, but it is not everyday-all day. Another idea that I have considered is substitute teaching along with rentals as there are schools within driving distance no matter where you live in Missouri. Summers would also be available to garden etc with subbing. It is not an “overnight” fix , but for our situation it is probably the smartest solution for meeting our goals. I am glad that I ran across your web page and am happy for your family that you are able to live your dreams right now… as opposed to having to delay them! 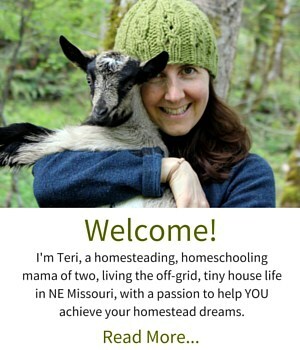 I will come back to your site to see how your homesteading lifestyle is progressing for you. You are definitely off to a good start! Thanks for reading (and for writing), Tami! Those all sound like great possibilities. I have a friend here who has been substitute teaching as much as possible so he can spend the summer working on his land (he’s also building an off-grid homestead). And other friends leave for a few months in the winter and sell Christmas tress in NYC. 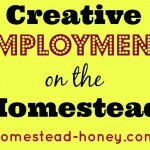 So lots of ways to make money so you can enjoy your homestead! I wish you the best! My husband, son and I just moved to the Ozark region of Missouri to start our homesteading adventure. We are hand building a small cord wood home; as I type my husband is peeling cedar logs while my son naps on me. We are looking into creative ways for income. Your blog has lots of good information, I love visiting it! Thank you Jenny, and welcome to Missouri!! We live very frugally on our homestead too, and are debt free, only having property taxes, electric( although minimal) and internet. We heat and cook with wood on our wood cook stove and in summer use a fire pit. We hope to build a summer kitchen and have our second stove and a cob oven to use soon. My husband went back to work, but it was because of medical insurance needs for our daughter. How do you budget for this since Obamacare? If it weren’t for her brain tumor and the need for health insurance we certainly could make enough to pay our expenses, we did it before Obamacare tax. We raise produce and animals that make up approx. 90% of what we consume. We also cook from scratch and buy only non-gmo/ organic foods we can’t produce for ourselves. We use a root cellar for our winter and fall crops and I can and dehydrate all we don’t consume fresh. We’ve been at this for almost 20 yrs and we’re still learning and adding new things. Hopefully this year, if not for sure next we’re adding bee hives to our homestead. I enjoy growing and using our own herbs for medicinal as well as culinary, we also grow 95% of our own herbal tea mixes. It’s a lifestyle no for all but we’re very blessed indeed and wake each morning with a few aches and pains( both husband and myself are in our 50’s) but happy to see what a new day will bring. Health insurance is definitely a big expense. We have some coverage through the MO health plan right now, but we end up paying out of pocket for alternative treatment such as acupuncture, chiropractic, and dental. Later this year, I imagine that we will end up with short-term “catastrophic” health insurance to cover any big emergencies. It’s one of my bigger concerns – that we stay healthy – but things happen (like you mentioned, tumors, which we dealt with a few years ago, and broken bones, which we’re dealing with now). I just happened across your blog reading about gardens. We are 1 year in on our 1 1/2 acre Colorado prairie homestead. While we still commute to work in the city for awhile, it is completely worth the effort. We downsized from a 2200 square foot monster house in the city and we bought a little farm house in disrepair. We lived in our camper last summer getting the house ready. It’s still needing work in the kitchen, but we have some debt to deal with before we do that remodel. We have been slowly adding gardens, grasses, and improvements as we have time. We realize we are in an unending educational adventure. Every month I learn something new about living in the country. We are setting ourselves up to acquire chickens, bees, and an orchard in the next year to two years. This land has been neglected and there are many resources to reestablish. I do feel blessed each morning when I hear the meadowlarks singing to me. Keep on with your dreams, it’s so worth it. I envision my grandchildren having the time of thier lives out here! Even 17 years into homesteading, I still learn something new every day! Enjoy your new land!! Thank you for sharing, I neede to hear some of this and reaffirm that we are on the right track. We didn’t choose this lfe because it was easy, but because it would be better for us, more rewarding, and we really enjoy doing these things. We are rounding out our first year at homesteading, and it’s “baby steps,” but we purchased a large property with lots of maintenance that needs to be done, we found out we were. expecting baby no. 5 just two weeks before we moved…luckily to a larger house! So we had our baby, and we had to do lots of work to get the gardens into good shape, the house needed that homey touch (lots of dirty walls =lots of painting), and we have been taking big steps (for us) towards self-sufficiency. We were blessed to find a home that had out buildings (including a chicken coop/garden shed) and a small established orchard, and it even came with chickens! Financially, we are not where I would like to see us, but if I am patient, in a few years time, we will be. And the circle of savings is an amazing thing! I cannot get over how every time I make one little change, it pays it forward to another area, which rolls over into another…I bought flour in bulk which allowed me to cost-effectively allowed me to make my own bread, which means fewer trips to the store, which equals gas saving, which means I have money to buy fruit trees which means I will grow more of my own food, which…I think you get the picture;) It hasn’t been easy, and it’s a lot of work, but I’m happier, my husband is happier, and the kids are too, plus they are learning SO much! Long story short, I sometimes need reassurance that we are indeed on the right path, and that we haven’t overlooked important steps to keep us in the right direction. Congratulations on your property! Sounds like you have lots of amazing resources to work with, and your homestead is coming along nicely. Baby steps are the best way to go! Thank you, and I’m sorry, I called you Tammy, and I knew it was Teri! I love your blog, by the way, you have given me a lot of great inspiration. Keep up the great work!